On the heels of the CES nightmare, it was refreshing to attend this year’s AXPONA at the Westin in Rosemont, just outside of Chicago. Not that the sound at the show wowed me. Even by normal hotel-room standards, the rooms at the Westin aren't very good sonically, so the average presentation in Chi-town was just okay (with some exceptions about which you will soon read). What was refreshing was the attendance, both industry and civilian. Unlike the ghost town that was this year’s Venetian, the Westin was full of exhibitors and music-loving audiophiles—crowded halls, crowded rooms, long waits for elevators, all of the stuff that smacks of a successful show. 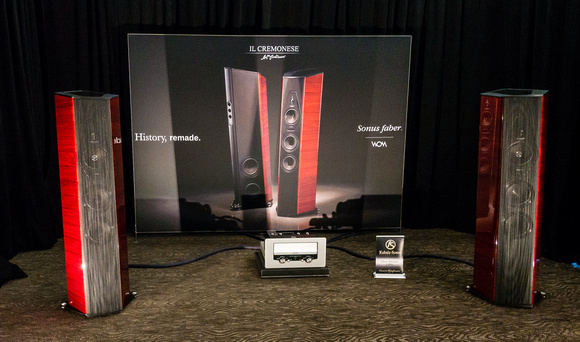 It is nice to know that high-end audio is still very much alive and well, at least in Chicago. Because there were so few debuts in my category—speakers priced at $20k and above—I’m going to do my usual thing: talk about the best-sounding rooms first and then some of the more interesting also-rans. As always, I apologize in advance for any mistakes in nomenclature, pricing, or system. I also apologize to any manufacturers, distributors, or dealers I missed. Like I’ve said so many times before, I’m just one guy with a briefcase full of blues, classical, and pop (although this year I had Ms. Mullins along for the ride, because she was covering the allied category of electronics at $20k and above). We do our best, but…someone always gets left out. Sorry if you’re the one. 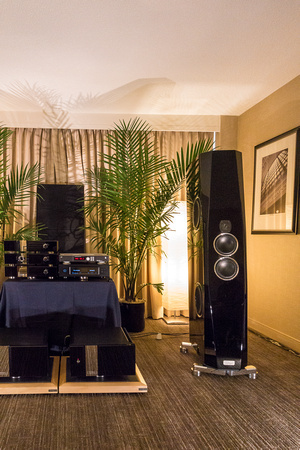 To my ear, the best sound in my bailiwick at this year’s AXPONA came as a complete surprise. To be perfectly frank, I’ve not been overly impressed by my long-time favorite marque ARC’s latest offerings, in part because its electronics have often been paired with Sonus faber loudspeakers, which, while fine in their own right, have never struck me as a good match with ARC. (Both companies are owned by the same outfit, Fine Sounds—now frighteningly rechristened World of McIntosh—and I guess WOM has no interest in strutting its electronic stuff with somebody else’s cones or membranes.) Well, guess what? This year, for reasons I can’t explain, the handsome, $45k Sonus faber Il Cremonese three-and-a-half-ways (1" “arrow-point” damped-apex-dome tweeter, 7" midrange, two 7" sandwich-cone woofers in an “acoustically amorphous” vented chamber, and two 8.6" “infra-woofers” in their own acoustically amorphous vented chamber) driven by those self-same ARC electronics (Reference Phono 3, Reference 6 linestage, GS150 amplifier), sourced by an AMG Giro 9 turntable, cabled with Kubala-Sosna Emotion, and supported by nonpareil Critical Mass Maxxum stands sounded just plain wonderful. 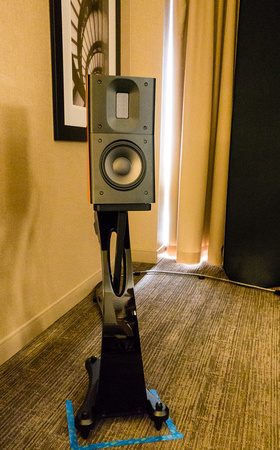 This exhibit wasn’t a little better than previous Sonus/ARC pairings; it was much better—and, IMO, better than anything else at AXPONA, particularly in the midband. Almost everything that I look for in a hi-fi system—everything I consider critical to a semblance of the absolute sound—was here: natural timbre, air, action, spectacularly lifelike imaging and staging, superb reproduction of texture and transient detail. Oh, the low end may not have been as extended or as powerful as what I’m used to at home with Magico MPros and JL Audio Gotham subs, but on the voices, guitars, brass, percussion, and standup bass of the Buena Vista Social Club’s Lost and Found or ORG’s fabulous 45rpm reissue of Peter, Paul & Mary’s In The Wind, the overall sound was so much like the real thing it gave me the proverbials. Next up is the gorgeous, $109k, Tidal Agoria three-way (1.2" diamond tweeter, two 7" black ceramic mid/woofs, two 11" black ceramic-sandwich woofers, augmented by three 11" black ceramic-sandwich sub-bass radiators) driven by Tidal’s own electronics. If I awarded a prize for most beautiful sound of the show, this system would surely have won. Absolutely lovely, delicate, dark, smooth, and relaxed on Cassandra Wilson, The Nylons, The Fairfield Four—on everything, in fact—the Tidals also managed incredible resolution of detail, and this when sourced by a digital front end! Aside from the usual flatness and bloomlessness of digital, this was a wonderful presentation. I only wish I could have auditioned the Agorias with an analog source. I’ve heard the $42.8k YG Acoustics Hailey three-ways (billet-core aluminum midrange and woofer and forge-core aluminum tweeter in a sealed aluminum enclosure) sound good many times in the past. Here, once again, they didn’t disappoint, driven by solid-state Audionet electronics from Germany. In spite of the fact that the Haileys weren’t subwoofed, they were still pretty impressive (and very linear) in the bass on David Bowie’s incredibly deep-reaching “Little Wonder” from Earthling and outstandingly natural in the midrange and treble on PP&M’s “All My Trials.” Oh, the system was a little flat and dimensionless compared to the ARC/Sonus exhibit, probably because of the solid-state electronics, but in all other ways it was superb. Another speaker I’ve liked in the past also had a good show: the $100k, three-way (1" diamond tweeter, 7" ceramic midrange, two 10" aluminum woofers), bass-reflex Marten Coltrane 3 floorstander, driven by Convergent Audio Technologies electronics, and sourced by a TechDAS 3 turntable with Graham ’arm and Van Den Hul cartridge. In spite of a bit of room-induced thump in the midbass, this system had dark rich color, superb focus, sledgehammer dynamics, and a very wide soundstage. Though three-dimensional, the Coltranes weren’t, once again, as realistically bloomy and airy as the ARC/Sonus system, because, I think, bloom and air aren’t CAT virtues. Still, I didn’t hear a trace of sibilance or roughness on Dream with Dean, and despite a bit of distortion in the right channel, PP&M’s “The Very Last Day” gave me goosebumps. 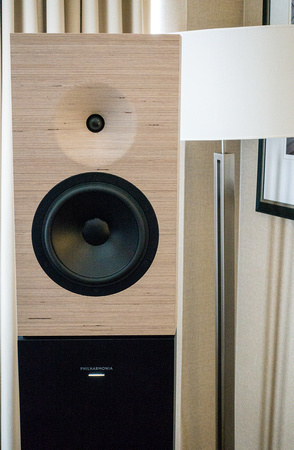 The tall (because of its large pedestal stand), massive (because of its gorgeous stacked wood enclosure, comprising 547 veneers), $39k Amadeus Philharmonia, designed in part by Jean Nouvel (who designed the Philharmonie de Paris), is a powered, pro-audio-based (124dB peak SPLs), two-way monitor with a claimed frequency response of 43Hz–22kHz +/-2dB. Yes, it costs one helluva lot, but you do get built-in amplification, 64-bit DSP/DAC, and a line-level analog input. More importantly you get sound that is simply fantastic. 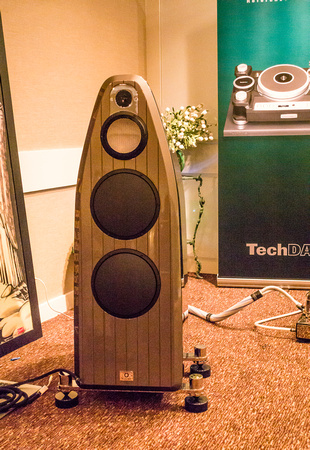 This speaker had truly incredible color, extension, and sock for a two-way (or an any-way). Indeed, it was so impressive it would’ve made my Top Five had I heard it perform the same way with music I was familiar with. This could be the most exciting compact monitor introduction since the Magico Mini, and it will certainly win my Most Significant Introduction award. Speaking of Magico. 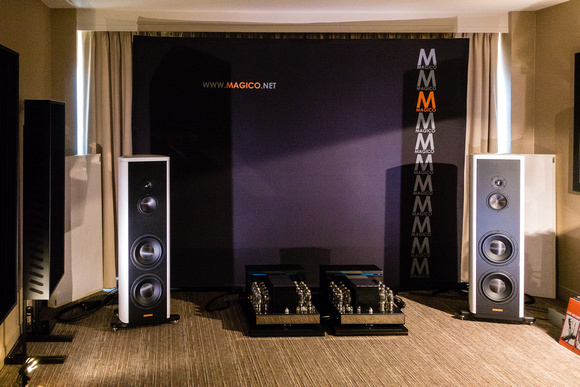 Driven by CAT electronics, sourced by a Kronos Pro turntable with ZYX Universe cartridge (and alternately by Jonathan Horwich’s two-track 15ips tapes), Magico’s $38k S5 Mk II three-ways (two 10" woofer, one 6" midrange, and one 1" beryllium tweeter) also came close to making the Top Five. In fact, they would’ve made the Top Five save for a little aggressiveness in the upper midrange—which added, for example, a touch of sibilance to Dean’s voice on Dream with Dean and a little brightness to PP&M’s harmonies on “All My Trials”—a little overall darkness of timbre (typical of CAT electronics), and a couple of room-related issues (a lack of focus and stage depth due to very close-to-the-wall placement). On the other hand, the Magico/CAT system was extremely lively with good dynamic spark and superior linearity in the bass. It sounded particularly wonderful with Horwich’s mastertapes. Sonus Faber’s $70k Lilium three-and-a-halfways (1.1" arrow-point dome tweeter, 7" midrange, three 7" sandwich-cone woofers, and one 10.2" sandwich-cone infra-woofer in a “stealth-vented” orthogonal enclosure), driven by Aesthetix electronics and sourced by AMG’s superb Viella 12 record player with DS Audio’s new Master 1 optical cartridge, sounded dark, rich, and gorgeous on Scheherazade. Bass was a little one-note and recessed, but that could have been the room. On my Deano LP the system was once again gorgeous and quite detailed, but also terribly sibilant on “Blue Moon,” bespeaking a room-induced cart/record player resonance issue. Raidho introduced its $29,750 (with stands) D1.1 ribbon/diamond cone two-ways driven by a $30k Aavik 300 integrated and cabled by Ansuz. Lars and Michael were only using digital sources in their room, so I found it hard to judge the sound. That said, the D1.1s certainly sounded big and bold, albeit a bit amorphous in imaging when I was sitting close up. (Another way of looking at this would be to say that they had a kind of surround effect—a very large wraparound soundstage.) The solid-state Aavik electronics had a surprising amount of bloominess (shades of Soulution), but I think the speakers were too widely separated causing left/rightness and a lack of centerfill on certain cuts. Having lived with Raidho D1s for several years, I can assure you that these speakers are top contenders—they just needed a better room and a better setup. Von Schweikert had a very good show with its $60k VR-55 Aktive multiway (front-firing metal-dome/beryllium tweeter, rear-firing ribbon tweeter, 6.5" ceramic cone midrange, and two actively powered 8" woofers) powered (at least above the bass) by VAC electronics. As was the case with the Raidho D1.1, this was an all-digital setup so it was hard for me to judge the sound, given that the music was mostly unfamiliar. Still, the presentation was quite lively and dense in color on jazz numbers with good (not great) kick-drum and very nice piano and bass guitar. The speakers had good definition and excellent reproduction of decay; they were also quite fast and relatively deep-reaching. If the drums hadn't been just a bit thuddish, this would’ve been a Top Fiver. The $75k JBL Project Everest DD67000 three-way horn/cone hybrid loudspeakers are, I admit, an acquired taste. I happen to love them, even though I can hear the seam between their twin side-by-side 15" woofers and their horn-loaded compression-driver midrange and tweeter. Driven by Levinson electronics, they were simply superb on Buena Vista Social Club—just terrific on voice and brass, very alive, very wide, very spacious. In fact, if JBL could’ve fixed the bass, which lacked definition in this room and added a bit of suckout at crossover to the lower mids, this certainly would’ve been in the Top Five. While were on the subject of horns, Avantgarde debuted its $34.6k UnoXD digitally optimized three-way horn/cone hybrids, driven by Avantgarde’s XD amplifier with DSP for crossover and bass optimization. The source was a Bergmann Sindre ’table. On my Buena Vista Social Club disc, timbre was dark with terrific transient response and astonishing detail. (The liveliness of horns was goosebump-raising!) Though there was a bit of a room-induced thump in the bass (which seemed to be coming from a separate driver à la the Everests), the sound was otherwise superb—on voice and brass and percussion. Smooth and fast fast fast and rich in the mids and treble. (The Class D XD amps lack bloom, though, and were, as noted, dark in timbre.) All in all, I thought this was a very impressive introduction. But then I like Avantgarde horns. 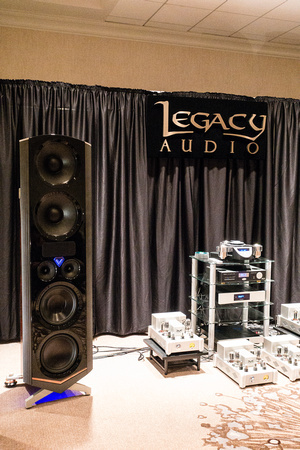 In yet another digital-only room, Legacy’s $51k DSP’d Legacy V driven by Raven 300B monoblocks performed well—bigger and fuller than their little brothers, the Aeris (which were also on display), with more solid and substantially deeper low end. As DSP’d systems go, this one wasn’t bad, although it had zero stage depth, making voices and instruments sound as if they were pressed against the window on some Lyn Stanley record or other. To be honest, I didn’t think the Legacy V sounded remotely real on anything I heard, although it was pretty, fast, hard-hitting, etc. Another powered and DSP’d system, the $20k Goldmund Logos Tower two-way (one 1" soft-dome tweeter, one 6.5" mid/bass with built-in two-channel 175W Telos amplifier) in a vented floorstanding enclosure, was very clear and fast, albeit a little bright, aggressive, and analytical, but with the pace, punch, and resolution Goldmund is famous for. 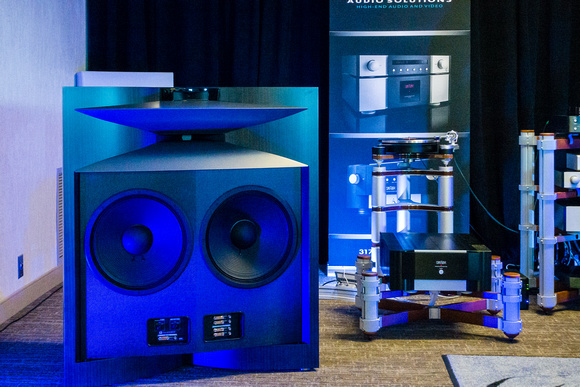 As is often the case at trade shows, the $25k Parsifal Anniversary three-driver three-ways driven by Zanden electronics and sourced by a TW Acustic Raven turntable (with Ortofon A95 cart) were a tale of two days. On Day One of the show, they were frankly terrible—flat, constricted, and aggressive on PP&M’s “Stew Ball” and other cuts I played. When I returned for a second visit on Day Three, they were greatly improved. Buena Vista Social Club’s Lost and Found suddenly had a much sweeter midrange, plenty of detail, and rich, even timbre top to bottom. Though images were a bit miniaturized at the low levels at which we were listening, and the bass was a bit slow and lagging and lacking dimensionality, the entire system was a whole lot better. 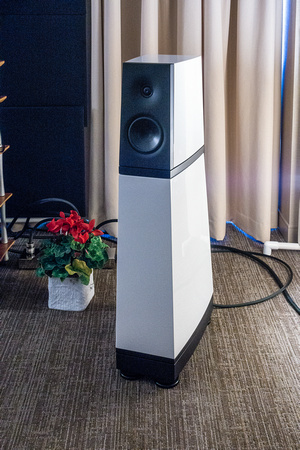 The $25k YG Acoustics Carmel 3, driven by Mola Mola and sourced by a Kronos Pro, sounded a little dark and ragged on my Buena Vista Social Club LP, albeit pleasant enough at the right volume (i.e., when the SPLs weren’t being pushed). 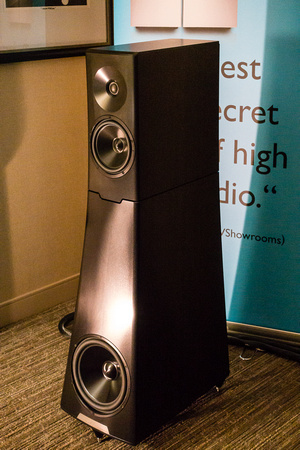 The Gamut RS7 floorstander was full, lovely, dark, and a bit amorphous on Take Five, with quite a bit of room-boom in the bass. The Nola Studio Grand Reference was hooded dark and overly full driven by Playback Design electronics, sounding almost like it had a honking resonance, which did wonders for baritone sax but not so much for female voice. The $53k Wilson Alexia driven by D'Agostino electronics sounded like “classic” Wilson—very prominent midbass, aggressive in the upper mids, soft on top, and a bit overblown in the bottom, producing a mix of sock and sharpness that some people love. 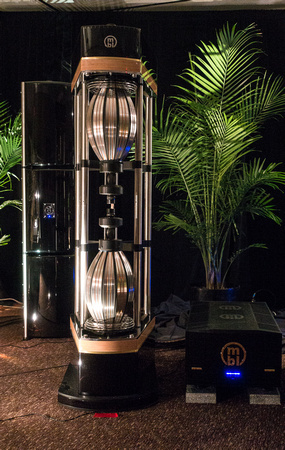 The $32k Hornung Eufrodite Mark IV Elipse driven by New Audio Frontiers and sourced by TW Akustic had plenty of air and bloom, albeit at a bit of a price in coherence, extension in the bass, and overall roughness. (This may not have been a great presentation but, as is the case with horns, it had a certain presence and liveliness you simply don’t get with a more civilized transducer.) The $23.6k Magico S3 with Devialet electronics and a Clearaudio ’table was very smooth and dark and controlled on digital sources, with a little room ring on the lead vocal of a Radiohead recording; the sound would have been lovely save for a persistent bit of treble/upper-mid glare. The $25k MartinLogan Renaissance 15 electrostat/cone hybrid driven by McIntosh were a bit too dark and thick for my taste, with the bass sounding as if it were lagging behind temporally on “Me and Julio” and “Walk on the Wild Side”; the speaker simply doesn’t have the coherence and transparency of a full-range ’stat—you can hear the woofer playing up into the mids. 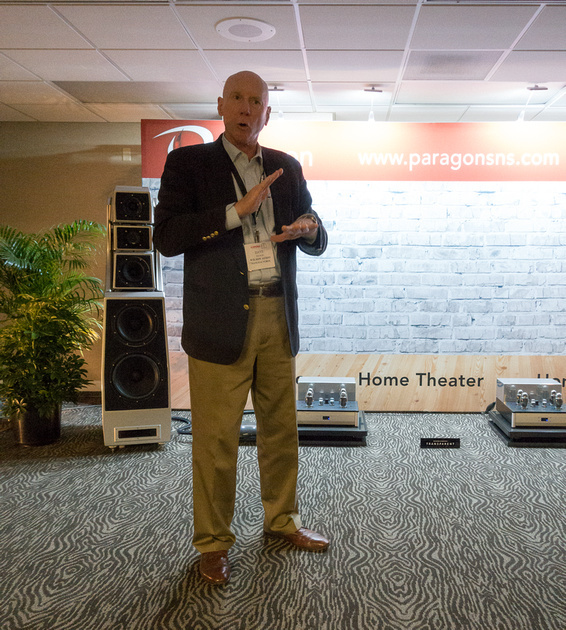 The $109k Wilson Audio Alexx multiway floorstander was intro’d at AXPONA. Intended to surpass the Maxx it was designed by David Wilson’s son, Daryl, who has been involved in development of Wilson Audio’s last 27 products, and single-handedly designed the excellent Sabrina. I like David Wilson—a lot. And I wanted to like Daryl’s new speaker as much as I liked his Sabrina. But…on this afternoon the Alexx proved to be a speaker I admired but didn’t love. In spite of its beauty, tonal weight, and smoothness, it was too thick and warmly colored for my taste. It just never sounded real (though, to be fair, others on our staff strongly disagreed). Though not in my price category I have to say a word about the Thrax room with the Döhmann Helix 1 turntable, Schroeder ’arm, and Lyra Atlas cartridge. That word is superb. I also have to mention an exciting development for reel-to-reel tape fans (like me). Acoustic Sound’s Chad Kassem, bless him, has decided to issue first-gen 15ips two-track dubs of several mastertapes. The first bunch will include R.L. Jones’ It’s Like This, Hugh Masakela’s Hope, Lightning Hopkins’ Going Away, Bill Evans’ Sunday At The Village Vanguard, Ben Webster’s Gentle Ben, Sonny Rollins’ Way Out West, Art Pepper’s Meets The Rhythm Section, Creedence Clearwater Revival’s Cosmo’s Factory, and the famous Athena recording of Rachmaninoff’s Symphonic Dances. This is astonishingly good news for high-end audiophiles of every stripe and will, I hope, help further stimulate the reel-to-reel revival. I heard several of Chad’s mastertape dubs (Rickie Lee Jones and Oscar Peterson) with $7k Joseph Audio Profile speakers, Rowland electronics, Cardas cabling, and an Ampex ATR-102 player, and it was simply the best sound of the show. There is nothing like reel-to-reel for continuousness and naturalness. I don’t have the official word yet, but I’d imagine that the Analogue Production tapes will sell for about the same amount as other commercial reel-to-reel issues and re-issues, i.e., in the $400­–$500/title range. Sonus faber Il Cremonese floorstanders driven by ARC Reference Phono 3, Reference 6 linestage, GS150 amplifier, sourced by an AMG Giro 9 turntable, cabled by Kubala-Sosna Emotion, and supported by nonpareil Critical Mass Maxxum stands. Joseph Audio Profile speakers, Rowland electronics, Cardas cabling, and Ampex ATR-102 player playing Chad Kassem’s 15ips two-track tapes. The revival of reel-to-reel tapes.